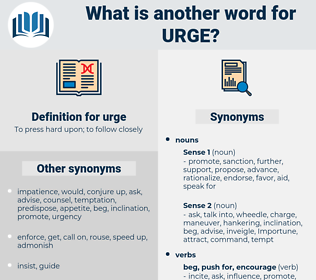 What is another word for urge? called, shared, Echoed, joined, Did. insist, implore, beseech, advise, beg, incite, suggest, argue, squeeze. encouraged, Has, persuade, insist, implore, induce, plead, advise, galvanize, pressurise, beg, solicit, supervise, incite, compel, convince, suggest, entice, argue, squeeze, impel, instigate, incentivize. dislike, deterrent, discouragement, block, indifference, disgust, distaste, hatred, hindrance, hate. hurt, halt, condemn, disapprove, prevent, let go, pull, discourage, dissuade, repress, deny, protest, reply, censure, turn off, refuse, reject, delay, criticize, oppose, answer, stop, hinder, repulse, check, retreat. I don't want to urge you. I had, however, no doubt that I should be able to get on with them if they could only put up with me; they were, I was assured, friends of the Bishop, and I did not think that he would urge me to go to any people whom I should not like. hurry, preach, bear on, push, rush, advocate.